Plot: In an alternate future (that resembles the 1950s, but with sci-fi technology) the world has been plunged into a nuclear war and Washington DC has been all but obliterated. To survive, people have crammed into these underground bunkers called Vaults. You play a nameless character who grew up in Vault 101 – which, unlike the other Vaults, did not reopen after it was deemed safe to go out into the world. You see yourself grow up briefly inside the Vault. You mother died during child birth, your friend gets picked on by the local bully, and your dad (super scientist) doesn’t get along with the Vault mayor (your best friend’s father). On your 19th birthday, you best friend comes into your room while you’re sleeping and says that her father is coming to arrest you. Your father has somehow left the Vault, and you have to follow him out into the Wasteland. From there, the decision of how to proceed is yours. Sneak out, shoot everything that moves, give your friend the gun – how do you want to escape? 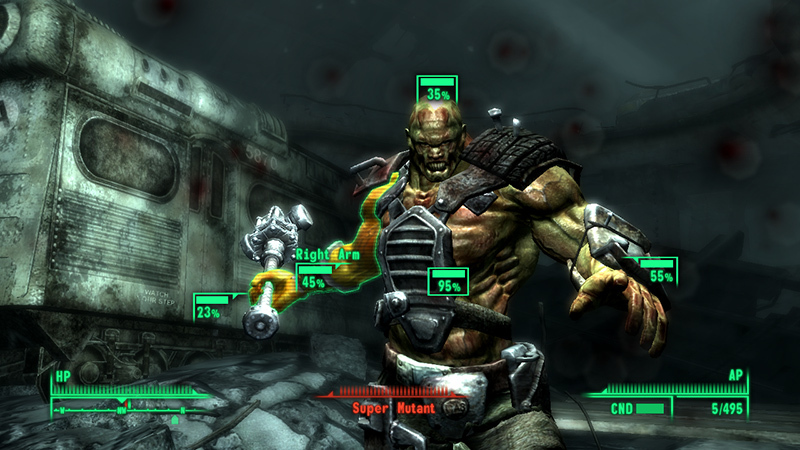 Upon exiting Vault 101, you’re greeted by the greatest video game character of all time: the environment of the Waste. DC, re-created as a post-nuclear war site, is you playground. You can proceed on missions, or just explore (which I spent most of my time doing). Ultimately, though, your goal is to find your father and what you decide to do from there will affect your game experience. I figured this would be an appropriate game to review for the new year (Happy New Year, by the way) because it’s a game about new beginnings – and that’s what every new year is about. The game can be played from a first or third person perspective (I recommend first), and you make choices – as well as shoot stuff. The neat thing about combat in this game is the VATS – which is their “VAULT-TEC ASSISTED TARGETING SYSTEM” that allows you to target specific areas on a character and attack there, based on the probability of the attack being a success. If you’re good with a weapon (and you’ll get good if you pump up your character stats), then you can even have slow motion gruesome endings to your enemies. Like slow motion decapitations by AK-47! It’s gruesome, but also awesome. The most fun thing about this game is the sheer size of it, and the freedom it provides. I spent hours of gameplay just exploring the Waste and killing raiding parties, stealing their stuff, and bankrupting towns by selling it all. After about 60+ hours in the game, I maxed out my level cap to 20 (if you download Brotherhood of Steel expansion this increases to 30), and and only explored about 3/8 of the whole map. Mind you, I was taking my time and just enjoying the game. Your play through will be different. And hopefully just as enjoyable. So Fallout: New Vegas came out as well, which is a sequel to the game. Apparently everything is just about the same, expect for the setting. I could go on and on about this game, but what’ll really sell it is if you play it for yourself. For your Halo fans out there, please note that this is a slower-paced RPG game that has a lot of conversation and decision-making. If you just want to go killing, you can do that – but that’s not the purpose of the game. If you don’t already own this game or it’s sequel, it’s certainly worth owning. I recommend it.